About me - gearssurfboardss jimdo page! Born in Kamakura Shonan, 1956. My friend and I used to ride a bicycle together,　doing a Niketsu ride（※） through the old Kotsubo tunnel to Kamakura Yuigahama when we were seniors, in elementary school. One day, I saw this American guy at the beach doing something extraordinary. He was running towards the waves from the beach with a round wooden board in his hands having the time of his life. (The board, I guess, was the original version of what we now know as a Skim-Board.) As a kid I was shocked and overwhelmed by what I saw. I went straight home, grabbed the first round thing I could see, which turned out to be a Tarai (a special old wooden Japanese water pouring thing which you would find in a Ofuro. ) and used it to draw a circle around on a Beniya wood (a sheet of plywood). Trying very hard to make a funky looking board like his. I cut it out with a saw, and painted it. That was my very first experience in surfing and shaping ever!!! Talking about first experiences, the first time I ever rode a long board was when I was 15 at Ippon Matsu Point in Koshigoe (a surf point in Fujisawa). I think I was riding a MALIBU SURFBOARD, then. Shaping came pretty natural to me since I’ve always been good with my hands. I just loved making crafts. 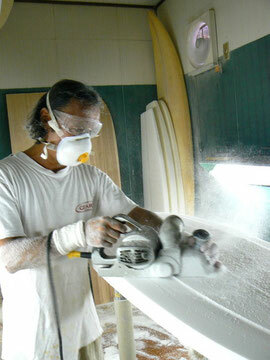 When I was 18 I landed in a job in a surfboard making workshop. I was so psyched to be working and living my dream but the reality wasn’t quite what I hoped. I felt like a spare part for the first couple of years there. But eventually I acquired the skills of shaping etc. and was on my way to becoming a board designer. After that I learnt to foil, sand, and laminate fins. That was back in the 70’s when the fledging surf industry was still finding its feet. Up and coming board designers were coming up with new designs all the time. It was a crazy time. The result of more than 30 years of tireless research and design are now seen in the quality of the boards available today. I found GEAR’S in 1985 and recently, I have actually turned back in time and started shaping Alaia. It started off by getting influenced by HIROSHI ABE from ABE SHAPE. Though, at the same time what also helped me shape was from watching old videos, and checking out the boards from those days in Tom Blake’s black and white photos. They were such great resources to widen my imagination giving me great inspiration. While I was inspired by these early greats, I always brought my own ideas to the boards that we made at GEAR’S. Alaia as you might know is wood and it’s not easy to shape. I literally had start shaping it, take it out on the waves, try it out, then take it back to the workshop (since it’s wood, it’s possible to do that). It’s a long and drawn out process of making them. These couple of years, I go surf around Chigasaki, Kamakura, even go to east reef points where ever there’s waves. I personally like to use and try out different kind of boards; Alaia (of course), long boards, “OMOCHI” (in Japanese it means sticky-rice-cake) which is made by a respect model, Simons, Pypo, and air-mats, depending on different wave conditions. Also, once a year I take part in professional long boarders competition. You can only feel that pounding excitement being in a competition, and it’s essential part of my life in order to feel that. Although, I believe that the most important feeling, which you should never forget, is to simply enjoy surfing. Seriously, I am a shaper but my life is more about surfing!! !